Moral purism is the view that doing evil is never allowed, even as a means to prevent a greater evil. This article assesses two main versions of moral purism and shows that they are implausible. The first version claims that it is always impermissible to choose an option that results in a bad states of affairs, while the second version claims that it is always impermissible to choose an option that is wrong, even if it is only prima facie wrong. I contend that both versions are incomplete, in the sense that they are unable to provide practical guidance for cases in which all available options result in bad states of affairs, or in which all available options are prima facie wrong. Doctor en Filosofía por la Universidad de Buenos Aires y becario del Consejo Nacional de Investigaciones Científicas y Técnicas (CONICET). Sus principales áreas de trabajo son: pobreza global; teoría no ideal; manos sucias en política; disputas definicionales sobre términos normativos. Algunas de sus principales publicaciones son: (2016) “Solving conflicts between domestic inequality and global poverty: Lexicality vs. proportionality”. Ethics and Global Politics 9: 1-16; (2016) “Utopias and comparative assessments of justice”. 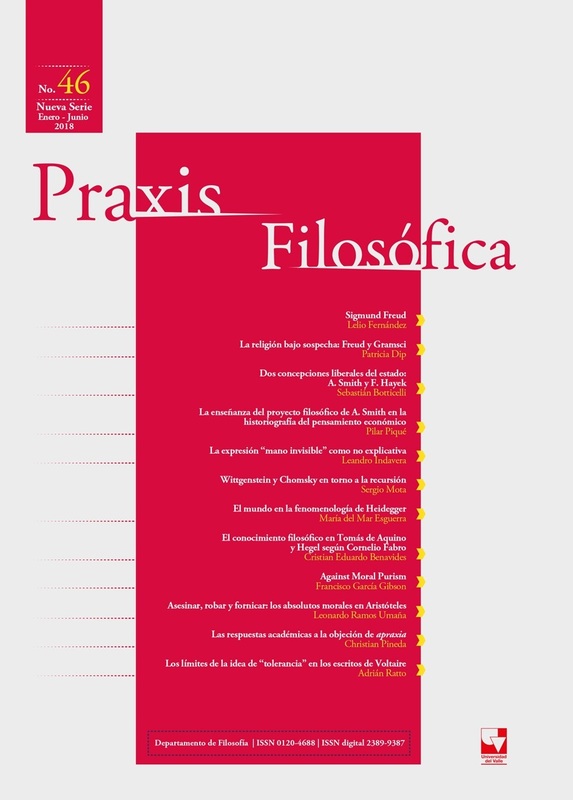 Metaphilosophy 47: 92-107; (2016). “Cómo resolver un conflicto distributivo”. Isegoría 54: 275-88; (2015) “Desigualdad global y coerción”. Análisis Filosófico 36: 55-73. Calder, T. (2015). The Concept of Evil. En Zalta, E. N. (Ed. ), The Stanford Encyclopedia of Philosophy. Recuperado de http://plato.stanford.edu/archives/fall2015/entries/concept-evil/. Gewirth, A. (1981) Are There Any Absolute Rights? The Philosophical quarterly, 31(122), 1–16. Hill, T. E. (1983). Moral Purity and the Lesser Evil. The Monist, 66(2), 213–232. Korsgaard, C. M. (1986). The Right to Lie: Kant on Dealing with Evil. Philosophy & Public Affairs, 15(4), 325–349. McConnell, T. C. (1981a). Moral Absolutism and the Problem of Hard Cases. The Journal of Religious Ethics, 9(2), 286–297. McConnell, T. C. (1981b). Moral Blackmail. Ethics, 91(4), 544–567. Nielsen, K. (2000). There is No Dilemma of Dirty Hands. En D. P. Shugarman & P. Rynard (Eds. ), Cruelty and deception : the controversy over dirty hands in politics (pp. 139–155). Peterborough, Ont. ; Australia: Broadview Press ; Pluto Press. Oberdiek, J. (2008). Specifying Rights out of Necessity. Oxford Journal of Legal Studies, 28(1), 127–146. Reisner, A. E. (2013). Prima Facie and Pro Tanto Oughts. In International Encyclopedia of Ethics. Blackwell Publishing. Donagan, Alan. (1977). The Theory of Morality. Chicago: University of Chicago Press. Finnis, John. 1983. Fundamentals of Ethics. Washington, D.C.: Georgetown University Press.